... But I Didn’t Get Squashed! 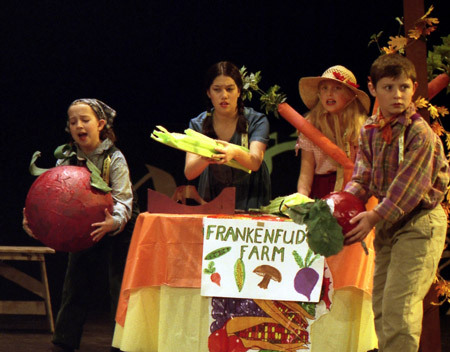 Scientist Dr. Felix Frankenfud and his nephew Andy have come up with the biggest genetic breakthrough of the century-an organic additive that produces super-sized vegetables! 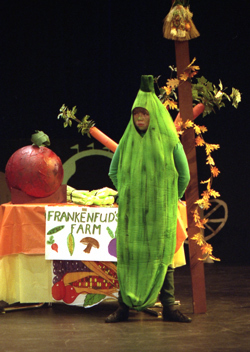 The veggie competition is fierce at the state fair this year, but Dr. Frankenfud’s gargantuan produce is bound to win the blue ribbon. Meanwhile, Andy finds himself with some competition of his own when he develops a crush on knock-out State Fair Queen Demi Tass and Tiger, her bullying boyfriend, wants to knock him out! Hoping to beef up into a hunk who can stand up to Tiger, Andy takes a hefty dose of the super-growth additive. 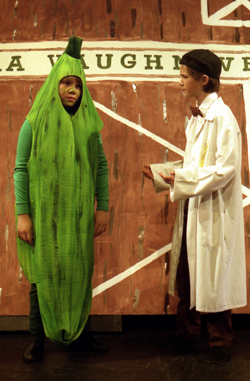 But the plan backfires when he turns into a giant zucchini, and the fairgoers set out to have him deep-fried! Read more...While a SWAT team attempts to capture the monster zucchini and Dr. Frankenfud hurries to find a solution to reverse the formula, a crooked member of the Vegatone Agricultural Conglomerate is cooking up a plan of her own. She has hired an industrial spy, Venus De Filo, to steal the formula from the unsuspecting Dr. Frankenfud so she can sell it to a rival company where her boyfriend is an executive! Will Andy escape the vegetable peeler-wielding mob? Your audiences will eat up this deliciously tongue-in-cheek comedy, and they’ll be hungry for more!